The Beautiful South were an English alternative rock group formed at the end of the 1980s by two former members of Hull group The Housemartins, Paul Heaton and Dave Hemingway. The duo were initially joined by Sean Welch (bass), Dave Stead (drums) and Dave Rotheray (guitar), all of whom stayed with the group throughout their 19-year career. Later additions included female vocalist Briana Corrigan; she was replaced by Jacqui Abbott, who in turn was replaced by Alison Wheeler. The group broke up in January 2007, claiming the split was due to “musical similarities”, having sold around 6,500,000 records worldwide. In January 2009, it was announced that the former members Dave Hemingway, Alison Wheeler, and Dave Stead would reform under the name New Beautiful South which was later changed to The South. The Beautiful South were originally conceived as a quintet with two lead vocalists, Heaton and Hemingway. Rotheray and Heaton, meanwhile, co-wrote the band’s compositions. On the band’s first album, Briana Corrigan was featured as a background vocalist; she was promoted to full membership status in 1990, and thereafter featured as a lead vocalist on numerous Beautiful South tracks, which helped to characterise the bittersweet kitchen sink dramas played out in Heaton’s often barbed songs. Also important to the band’s sound was studio keyboard player Damon Butcher, who, though never an official member of the group, played virtually all the piano and keyboard parts on the band’s albums. The band’s first album was Welcome to the Beautiful South (1989) and spawned the hits “Song For Whoever” and “You Keep It All In”. The release of 1990′s Choke album saw the band claim its only Number 1 hit, “A Little Time”. 0898 Beautiful South followed in 1992, with hits including “Old Red Eyes Is Back”. However, in 1992, Corrigan left the band to pursue a solo career, a decision that was prompted partly by a desire to record and promote her own material (which she felt was not getting enough exposure in The Beautiful South) and partly by ethical disagreements with some of Heaton’s lyrics, particularly songs such as “36D”, which criticised British glamour models and the industry that employed them. Hemingway later remarked, “We all agree that we should have targeted the media as sexist instead of blaming the girls for taking off their tops”. In 1994, St Helens supermarket shelf-stacker Jacqui Abbott was brought on board to fill in as the new third lead vocalist for the band. 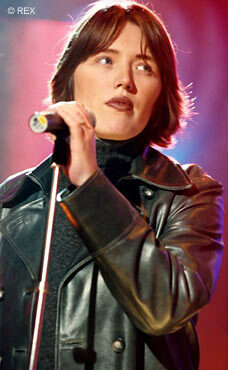 Heaton had heard her sing at an after-show party in St Helens and remembered her vocal talents. Heaton referred to her as “the lass from the glass” – a reference to the Pilkington factory in St Helens. Abbott’s first album with the band was Miaow in 1994. Hits included “Good as Gold (Stupid as Mud)” and a cover of Fred Neil’s “Everybody’s Talkin’”, previously popularised by Harry Nilsson. The end of that year saw the release of Carry on up the Charts, a “best of” compilation consisting of the singles to date plus new track “One Last Love Song”. In 1995, the band was one of the support acts for R.E.M. on the British leg of their world tour. The 1996 album Blue Is the Colour sold over a million copies, and featured hit singles “Rotterdam” and “Don’t Marry Her”. The album demonstrated the band’s gradual shift towards a country music sound, and was well-received by the public and on BBC and commercial radio. In 1997 the Beautiful South headlined stadium concerts for the first and last time, in Huddersfield and at Crystal Palace National Sports Centre in London. Support for the Huddersfield concert was provided by an up-and-coming Oasis. The album Quench (1998) was released with similar commercial success, again reaching number one in the UK album charts. “Perfect 10″, the first single to be released from the album also provided the band with uncharacteristic singles chart success. The album is also notable for being more up tempo and being the first where Norman Cook was used in a consultancy role. Painting It Red (2000) followed, with promotion and touring difficulties with a substantial number of the CD were faulty, and Jacqui Abbott’s leaving of the band shortly afterwards. After a second Greatest Hits album Solid Bronze in 2001, the band took time off and Heaton embarked on his first solo project. Regrouping in 2003, they recorded Gaze with yet another female vocalist, Alison Wheeler. Wheeler was still in place for 2004′s Golddiggas, Headnodders and Pholk Songs, which was an album of unusually arranged cover tunes including “Livin’ Thing”, “You’re The One That I Want”, “(Don’t Fear) The Reaper” and “I’m Stone In Love With You”. One track from the album, “This Old Skin”, was presented as a cover of a song by an obscure band known as The Heppelbaums; it was later revealed to be an original Heaton/Rotheray composition.